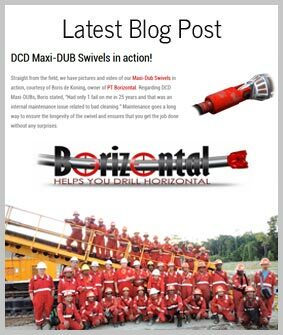 The DCD Corner Block is used to guide cable around turns whether you are pulling cable in the horizontal or vertical position. The Corner Block maintains a 19" radius through the arc of the corner block. 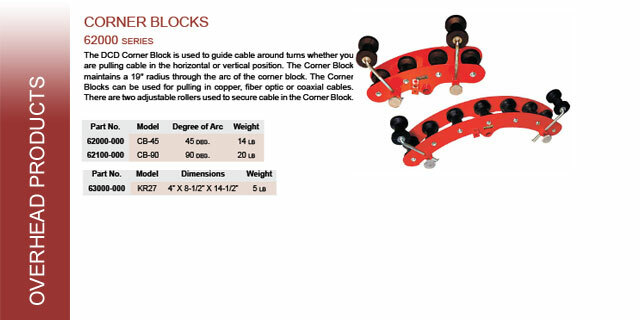 The Corner Blocks can be used for pulling in copper, fiber, or coaxial cables. There are two adjustable rollers used to secure cable in the Corner Block. 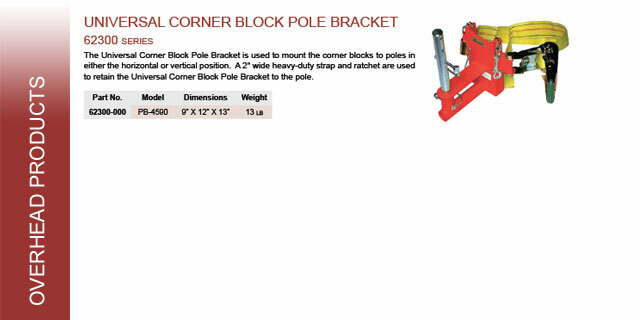 The Universal Corner Block Pole Bracket is used to mount the corner blocks to poles in either the horizontal or vertical position. 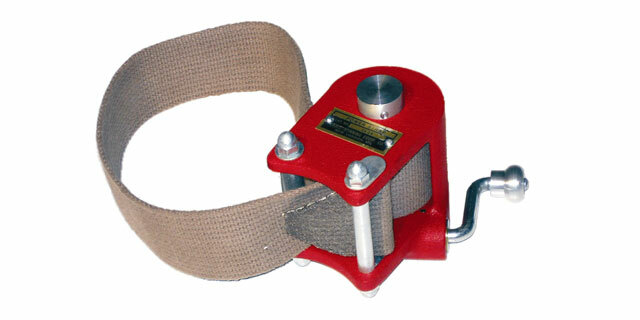 A 2" wide heavy-duty strap and ratchet are used to retain the Universal Corner Block Bracket to the pole. 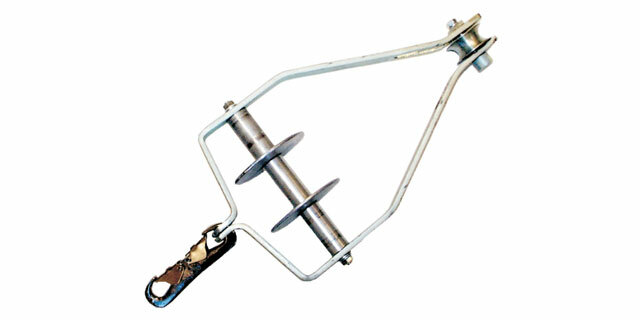 The Roller Cable Guide is used to raise large diameter single cables or multiple cables up to the cable lasher when lashing to a supporting strand. 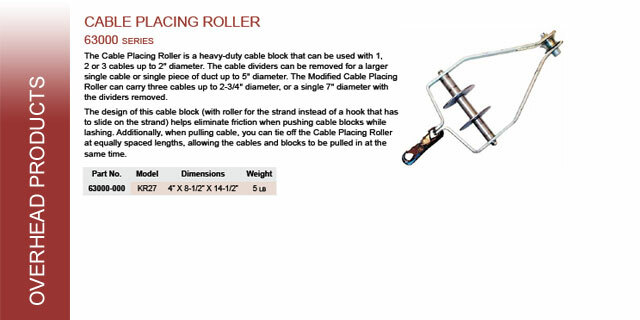 When using cable blocks, the Roller Cable Guide can also be fixed in one position on the strand and used to pull cables in to the cable blocks. 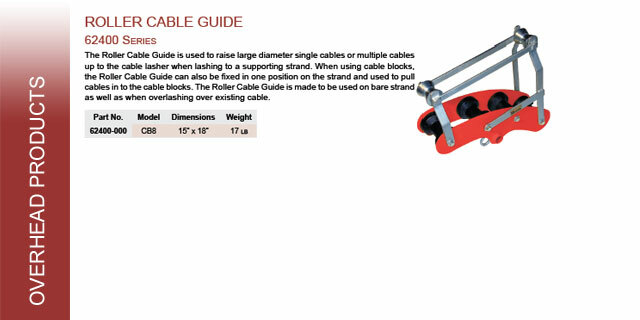 The Roller Cable Guide is made to be used on bare strand as well as when overlashing over existing cable. 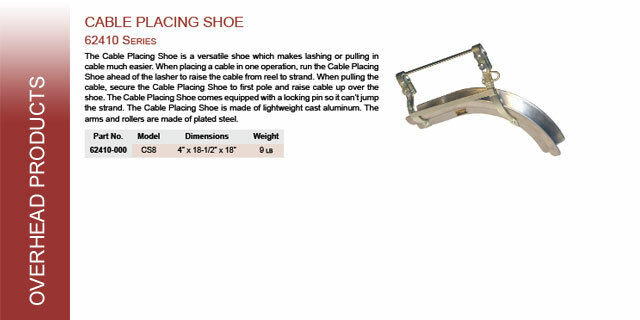 The Cable Placing Shoe is a versatile shoe which makes lashing or pulling in cable much easier. When placing a cable in one operation, run the Cable Placing Shoe ahead of the lasher to raise the cable from reel to strand. When pulling the cable, secure the Cable Placing Shoe to first pole and raise cable up over the shoe. The Cable Placing Shoe comes equipped with a locking pin so it can't jump the strand. 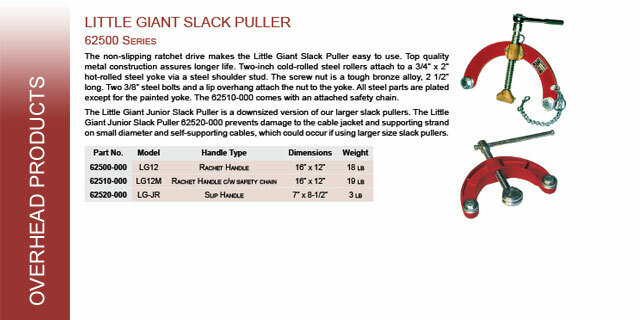 The Little Giant Junior Slack Puller is a downsized version of our larger slack pullers. 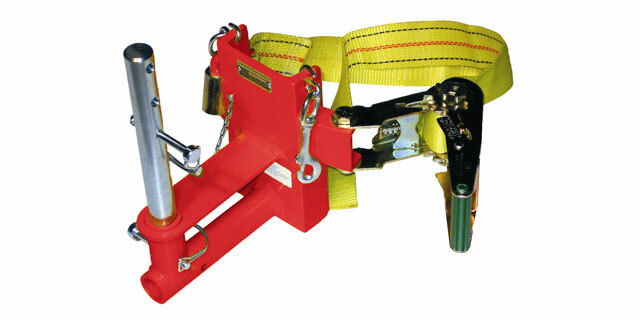 The Little Giant Junior Slack Puller prevents damage to the cable jacket and supporting strand on small diameter and self-supporting cables, which could occur if using larger size slack pullers. Constructed of heavy cotton webbing in a cast-aluminum housing, the Power Strap will position or secure mechanical sleeves, hold cable firmly while splicing or to raise large aerial cable to the strand. 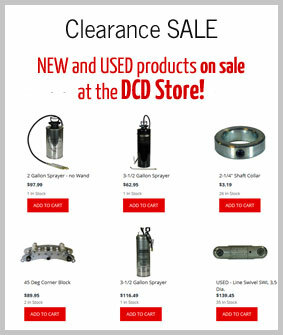 The Power Strap will fasten items to trucks, hold bundles or secure gas bottles to poles. 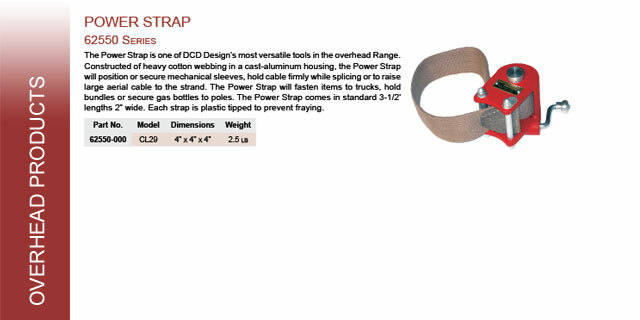 The Power Strap comes in standard 3-1/2' lengths 2" wide. Each strap is plastic tipped to prevent fraying. 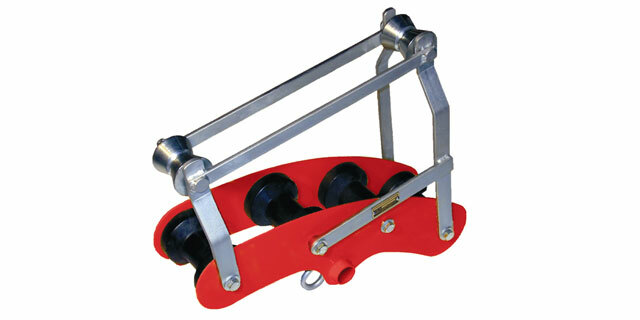 The Cable Placing Roller is a heavy-duty cable block that can be used with 1, 2 or 3 cables up to 2" diameter. 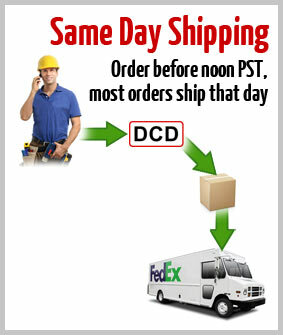 The cable dividers can be removed for a larger single cable or single piece of duct up to 5" diameter. 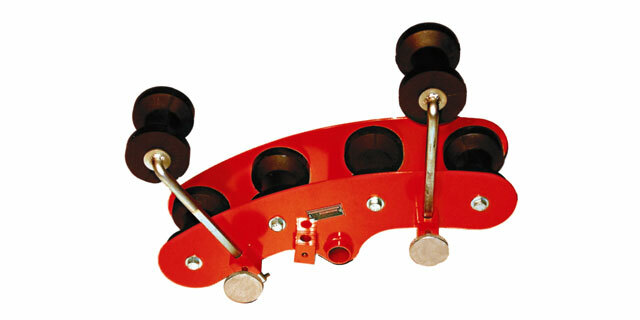 The Modified Cable Placing Roller can carry three cables up to 2-3/4" diameter, or a single 7" diameter with the dividers removed. 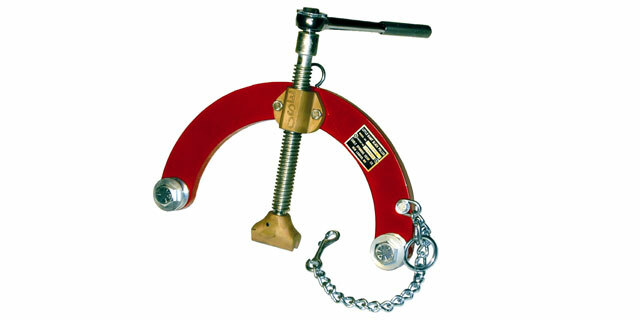 DCD Lashing Wire Clamps are available in a range of sizes to suit your strand diameter. 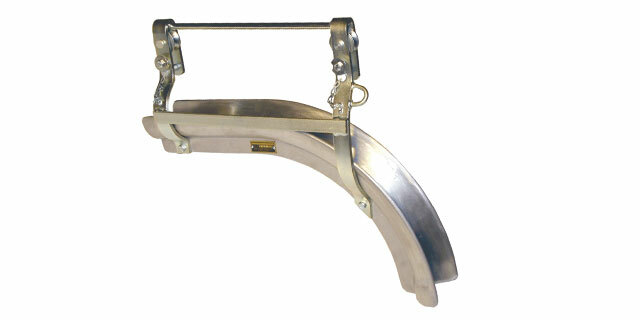 Two-piece clamps offer independent jaws; one-piece clamps form the jaws from a single metal plate. 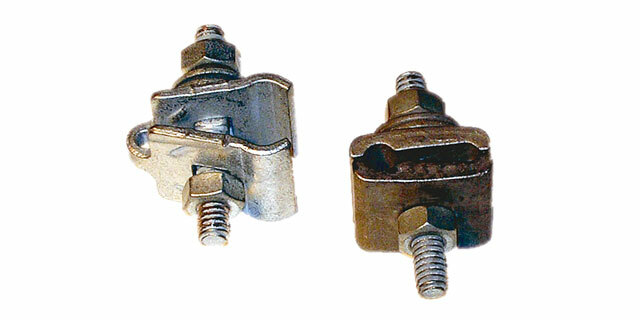 Metallic clamps (shown) are furnished with a double ended stud bolt and washers and free running nuts; all galvanized. 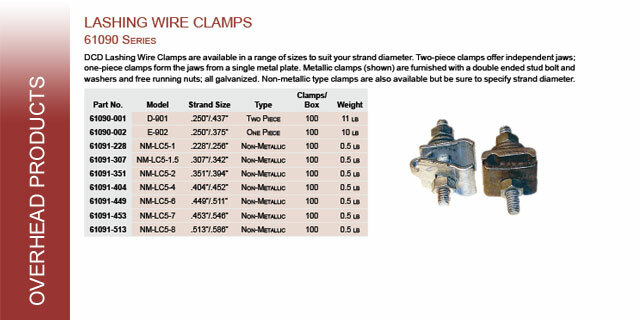 Non-metallic type clamps are also available but be sure to specify strand diameter. 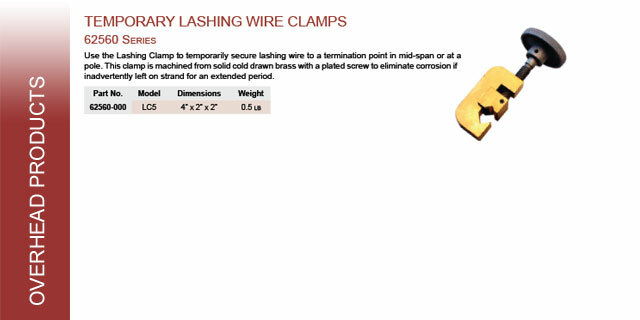 Use these Lashing Clamp to temporarily secure lashing wire to a termination point in mid-span or at a pole. 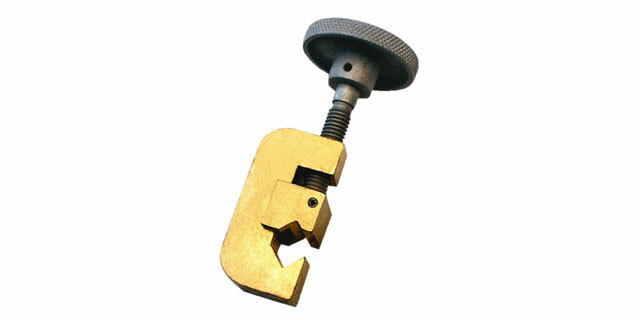 This clamp is machined from solid cold drawn brass with a plated screw to eliminate corrosion if inadvertently left on strand for an extended period.